The first theatre built after World War I is an astonishing piece of architecture. Built in 1922-4, it preceded the arrival of the Art Deco and Modernist style whose smooth curves were to dominate the inter-war period. Instead, it takes its inspiration from the artistic style of Cubism, with an unpredictable, blocky geometry that constantly defies expectations and divides opinions. 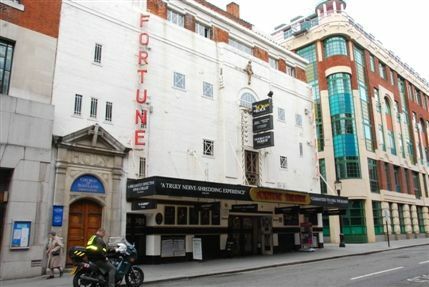 The quirkiness of the architecture is matched by the Fortune’s most influential show 'Beyond the Fringe' (1961), the show that launched the careers of Peter Cook, Dudley Moore, Jonathan Miller and Alan Bennett, and which has been credited with the invention of modern satire and stand-up comedy. Calling your theatre the Fortune is asking for trouble – the Elizabethan theatre with the same name burnt down in 1621 - and failure dogged this intimate playhouse from its opening. For much of its existence it has been unable to make money and was reduced to staging amateur productions. Then, in 1989, Stephen Mallatratt’s 'The Woman in Black' arrived. This brilliant shocker has been filling the Fortune ever since, based almost entirely on word of mouth.